Rencraft was established in 1981, with the aim of providing high quality handmade furniture coupled with great client service. Growth has been consistent and the company designs, builds and installs solid wood kitchens throughout Kent, Great Britain and across Europe. From their Kentish workshops, Rencraft produce stunning made to measure kitchens and furniture for every room, which include bedrooms, bathrooms, home offices and media units. Materials include oak, walnut, maple and hand painted finishes. Their designers work closely with each client to produce an end result that is unique each and every time. 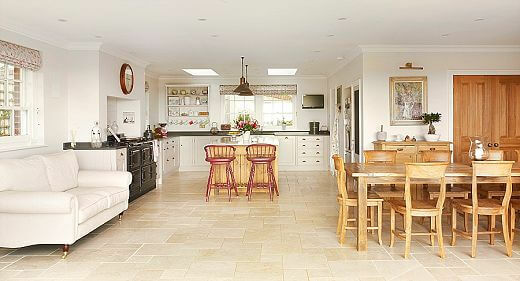 Designer Steve Sellen did the honours for this calm, creative and practical country house kitchen. Our client had some very specific ideas for the kitchen. Crucially, they didn’t want the island to look like a fitted part of the kitchen. Instead, the client wanted it to look more like a collection of furniture, almost like an old pastry workstation which would have been an entirely separate entity to the rest of the furniture. It was also important that the kitchen matched the overall tone of the house. The client loves to travel, and this is reflected in the interior of their home, which tends to stick to a soft colour palette with the odd splash of colour. In addition, the open plan kitchen-dining room has some stunning and expansive views of the countryside and we all wanted to make the most of the beautiful outlook. We worked very closely with the homeowners in helping to fulfil their needs and wishes but at the same time were given a free reign regarding the design. This was a completely ‘one-off’ bespoke kitchen, carefully designed around the generous size of the room and the beautiful views. The cupboards were painted off-white to match the softer tones favored throughout the house, with a dark black Caesarstone quartz worktop. The kitchen also features a painted door with chalkboard which leads through to a pantry. Following the brief to make the island unit stand out from the rest of the kitchen, the island unit is made from European oak which we distressed and treated to make the finish look authentic and natural. The worktop on the island is a lighter quartz marble top, creating a bold contrast with the darker surfaces. By keeping the space light and airy, we ensured that there were plenty of options for the clients to display items collected on their travels. It was also very important to get the configuration right to create a space where the family can cook, live and eat while making the most of the beautiful views at the other side of the room. The house was originally built in the early 1900’s, and commands fantastic views over the Kent countryside. Our client was keen to make the most of these with regard to any improvements and alterations.The building work took at least 6 weeks prior to the kitchen going in, and the major part was quite a large extension to the open plan kitchen/dinner. I worked very closely with the client and her builders every step of the way to ensure the communication of what was required was strong and cohesive. It was very much the client, builder and Rencraft working as a team that was the backbone behind this project working so well. The island was a real focus for this kitchen, and the contrasting surfaces and materials make it a real statement piece that nonetheless ties in with the feel of the house. With the option of adding pops of colour through the stools and accessories in the kitchen, the whole project matched the client’s interests and personality right from the beginning – something which we are always keen to achieve in all our work. With such spectacular views available, we wanted to make sure we made the most of this light and open space, and the careful configuration of the room and the appliances meant we were able to do this to great effect. In terms of initial designs, you shouldn’t expect to pay anything for these. If these are then taken to the next stage and translated into a complete set of drawings, there may be a charge. Ideally you will need a couple of sessions initially with the designer from which he/she should be able to give you a rough design and costings. 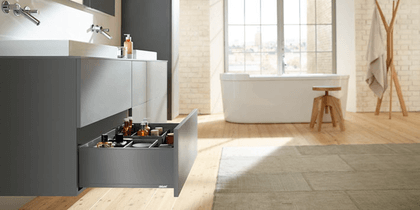 One of the early things to look at are the colours of your worktop and flooring, rather than the colour of the cabinets. People often automatically start with the cabinet colour but as nowadays they can often be painted in any colour, it’s better to concentrate on the flooring & worktops as there is less colour choice in these. Fine tune these first and then match in the cabinets later.